:I don't know. It's still quite different from the 2nd generation... gameplay seems closer to the 3rd 2D generation overall. 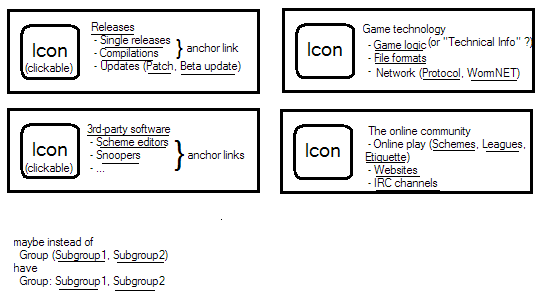 In keeping with the theme of the second-generation, the first-generation has the game icons next to the names. Unfortunately as the icons were sourced from the Amiga versions - WormsDC being an Amiga exclusive and the Amiga version of Worms being the only version that ''had'' an icon - they don't quite look the right shape. :So, why not just add an infobox for subpages under [[Weapons (Worms Unlimited)]]? We already have a "detailed description" and "commenting" using the subpages and talk pages. :* It's a maintenance nightmare. I'd have to maintain X more domain names and wikis / wiki databases. :* The *.worms2d.info namespace is already used by Worms-related projects and community websites. Colluding them with WKB translations would create confusion and risk collisions. :If you pick a consistent naming convention (I see some people disregard existing conventions and just use the translated name), I can look into setting something up to automatically change the interface language appropriately. Should I add link to Russian page on other pages? Like, I've created a [[Заглавная_страница|translation to Main Page]]. And do I have to add it to other Main Pages' languages list?